...that Andrew Del Rio became a popular senator of the UEG after he was relieved of command of UNSC Infinity? "I am not Tartarus or some fanatic. I am not Truth. I am not Regret. I am their remedy." — Atriox to a group of would-be assassins. Atriox is the powerful Jiralhanae warmaster who leads the Banished, a violent faction of ex-Covenant mercenaries and rogues. He originally fought on behalf of the Covenant, but was banished after thwarting his own execution. A deadly warrior and brilliant military leader, Atriox inspired many others to join him in exile. 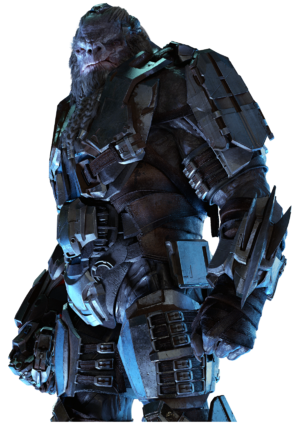 He has led his followers for over a decade, during which time he amassed an large amount of ordnance and materiel, especially following the collapse of the Covenant Empire in 2552. By 2558, he had become a symbol for even Jiralhanae not serving with the Banished to rally around. Atriox's full ambitions are unclear, but they are grandiose. His largest play for power came at the end of 2558, when he led a large force to Installation 00 with the intention to use its forges to build Halo rings. After months of occupying the Ark, the Banished were confronted by the UNSC Spirit of Fire and a battle for control of the immense Forerunner construction ensued. In a matter of days, Atriox lost his right-hand man, his fleet's flagship, and a newly constructed Halo was sent through a portal to the Soell system, placing it beyond his reach. "During the war, the Covenant used his clan as expendable muscle. Told them dying in battle would 'speed their holy journey'. Forty at a time, they carelessly sent them in. Forty to break the front lines. Forty to die for beliefs not their own. And none ever returned. Until he did." — Isabel recounts Atriox's story to the bridge crew of the UNSC Spirit of Fire. Atriox leads Jiralhanae of his clan into senseless battle. of the Silent Shadow and charged with hunting down demons. At one point, these four captured a squad of Orbital Drop Shock Troopers during a raid and interrogated them for three days. From these ODSTs they learned of the rumor that the SPARTAN-II program had abducted children as its subjects. Late in the war, the Covenant began to use Atriox's clan for frontline troops, throwing them against the United Nations Space Command. Groups of forty Jiralhanae would be sent to storm enemy positions, clearing the way for follow-up attacks, but typically all of the attackers would die in the process. Sometimes repeated waves would be ordered against entrenched humans even when it was clear the battle had already been won, making it seem as if the leaders simply wanted blood, regardless of which side it was spilled from. Atriox was the first to return as the sole survivor of one such suicide mission — a feat which he repeated multiple times after that. 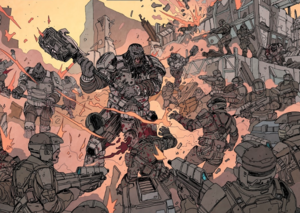 During one engagement, Atriox and thirty-nine others of his clan assaulted the last bit of UNSC resistance on a planet, led by First Sergeant Jessica Kress. By this point he had already distinguished himself enough to warrant a leadership role during the assault. He led warriors through a breach in the western section of the humans' base. Atriox charged headlong into the enemy's position, slaughtering marines mercilessly. Before long, instead of only Atriox remaining among the Brutes as usual, there were only two human survivors: Sergeant Kress and another marine. These two attempted a daring escape through a packed crowd of many Jiralhanae in an M12 Warthog but Atriox fired upon the vehicle with a Type-33 fuel rod gun, killing its gunner and throwing Kress from the chassis as it flipped over. He casually approached the last living human on the planet and waited, allowing her to stand and assume a fighting posture with a combat knife. The marine bravely lunged forward at Atriox but he caught her in the gut with the haft of his Type-2 gravity hammer. As she collapsed, he raised it overhead and brought the head down on her exposed form. The Executioner: "Atriox. you have murdered one of your own. Stolen the life of your brother. Stolen him from the holiness of the Great Journey. We observed the battle to study the strength of our enemy. Instead, we found a heretic. Your blasphemy corrupts the Covenant." Atriox: "He was a slave. A puppet sent to kill me. I relieved him of the burden of that shame." — Atriox faces his executioner with defiance. Atriox in a bloody battle frenzy on Algolis. As Atriox continued to lose pack-mates over the course of many battles, his resentment toward the Covenant, and the Prophets in particular, grew. Tales of his improbable survival made him legendary in the eyes of many. However, Atriox did not believe in the Great Journey and viewed the genocide of the humans as wanton. In 2549, during the occupation of the human colony of Algolis, Atriox returned once more to base as the only living veteran of a recent battle. The Sangheili in authority over the group of Jiralhanae to which he belonged was troubled by the cult of personality surrounding Atriox. Speaking to the High Prophet of Truth via remote communication, he noted that Atriox was never supposed to have survived this long. His unprecedented success and celebrated reputation could pose a threat should the Jiralhanae begin to question their role in the Great Journey, specially given rumors that his faith was already wavering. Truth believed Atriox could still be a valuable tool of warfare, and stated that he would only sanction his elimination if it was confirmed that he had lapsed in his loyalty. Atriox was seated alone, still covered in the blood of humans, when the Sangheili approached him. His commander offered praise of his prowess, but Atriox rebuffed it by saying it was simply the duty he had been assigned. Further congratulations drew his ire and he told the Sangheili that he doubted his brothers were defending the Great Journey as opposed to dying pointlessly. He also rebuked the underestimation of the humans' abilities that ostensibly caused so many of his pack to continually be killed and said that perhaps absolute loyalty was not the path to righteousness as the Covenant taught. It was reported to Truth that Atriox was even more dangerous than they had feared. The decision was made to have him murdered, but it was agreed that it must be done so delicately in order to avoid martyrdom. Atriox kneels before his executioner. Another battle on Algolis was soon underway, and Atriox once again found himself being flown into the heart of it surrounded by other Jiralhanae, all of whom were outwardly inspired by his presence save for one, who locked eyes with him during the flight. Atriox savaged the marines garrisoned at the compound they were assaulting and his movements during the conflict were carefully watched by the Sangheili hoping for his death through the use of San'Shyuum Eyes that flew over the carnage. Having secured victory, Atriox found a wounded marine and instead of finishing him off right there, told the young man to run. As he did so, Atriox lazily followed after him. The marine stumbled and fell and as Atriox came closer he loudly proclaimed his frustration and hatred for the Covenant's lies to the frightened human. He finally killed the man, and turned around to find himself facing the Brute with whom he had stared down during the Phantom ride into battle. This warrior challenged the blasphemy he had overheard and Atriox desperately implored him to use reason and to see the Covenant's beliefs and strategies for what they were. Despairing of the possibility that his zeal could be argued away, he raised his hammer and dared the accuser to fight him. He took a hard blow to the side, but in the end Atriox stood triumphant over the Jiralhanae's corpse. Returning once more to the base alone, he was met by a group of Sangheili led by their commander, his would-be Executioner. The murder of his brother on the outskirts of the battlefield was used as a pretext for this sentence. Atriox begrudgingly surrendered his gravity hammer and dropped to his knees, seemingly accepting his fate. He did not fail, however, to boldly and unapologetically defend his reasons for killing the one who would have done the same to him. When a bloodblade was thrust toward his face, however, he caught the blade with his right hand and asked that those present watch what happened next. Rising to his feet, he ran the one who presumed to be his executioner through with his own sword. The other Sangheili drew their swords and prepared to attack him together, but at that moment other Jiralhanae who had been watching, including a particularly fearsome Brute known as Decimus, leapt into action. Inspired by Atriox's defiance, they slaughtered the Sangheili. Decimus knelt before Atriox as others howled in affirmation of their decision to follow him, and from this moment, the group that would come to be called Banished was born. Atriox gloated over the dead by saying "How the righteous fall". "So he's not just stealing armaments, he's recruiting. At the moment he's still using guerrilla tactics, which means he's still small time. Still, I'm impressed he's still alive." Atriox inside the Carter Guard Armory, as seen through the footage of an ODST's helmet camera. Now enemies of the Covenant, the Banished were forced to become self-reliant. Atriox's subordinates were mostly Jiralhanae, but there were also Unggoy that had already been assigned to certain Jiralhanae and those who were kidnapped from the Covenant and pressed into servitude. They took to raiding Covenant resources to not only survive, but to continuously build themselves as well. Eventually, the UNSC became a target of these raids as well. In early January 2550, the Banished raided the Carter Guard Armory. Atriox personally killed a group of Orbital Drop Shock Troopers defending it with his bare hands. Helmet cam footage from Sergeant B. Wright, an ODST killed in the raid, provided the Office of Naval Intelligence with its first look at Atriox, who was identified to agents by a captured Unggoy that had been forced to serve him. The attack on the armory was unique because the Covenant typically did not bother to steal UNSC equipment, whereas the Banished emptied the place of gear. That same year, they moved against a Covenant training camp. When the UNSC deployed Marines to this camp in June, they found it depleted of all vehicles and weaponry with no signs of life but for a few dead Sangheili. This evidence, when reviewed months later, offered the first indication to ONI that Atriox was not only raiding, but recruiting as well. Atriox metes out justice to one of his own. By November 2550, Covenant-held locations had been found in similar states seven different times, the most recent of which was a forward outpost meant to be attacked as part of Operation: SLOW DIVE. The ONI agents monitoring Atriox's activities surmised that they might be able to use his guerrilla tactics to their advantage when it came to coordinating their own offensives against the Covenant and even dared to wonder if some sort of agreement could be reached with him. At some point prior to the end of the Human-Covenant War, Atriox was aboard a CCS-class battlecruiser in preparation for leaving a location that had been looted. When Atriox gave the order to engage its engines, however, a series of hull breaches on multiple decks throughout the ship suddenly caused rapid decompression. One of these breaches, torn through the hull by unexpected detonations, was on the bridge where Atriox was. Thinking quickly, Atriox grabbed a Jirahanae in a vacuum suit and hurled him at the hole. The armor sufficiently stopped any further loss of air. Indignant at what had occurred, Atriox ordered Decimus to delegate the task of investigating what went wrong to a new chief engineer his right hand had recruited. Decimus pointed out that the Brute plugging the bridge's hull breach at that very moment was in fact that chief engineer. Filled with suspicion, Atriox questioned the individual regarding the fact that he was the only one wearing a vac suit when the explosions went off. He claimed he had only just returned from making repairs on the out hull, but Atriox refused to give deference to his excuse. He reasoned that he was either lying, and therefore a saboteur, or he was incompetent. Either way, the engineer deserved to die. Atriox strangled him where he lay against the interior hull, leaving his corpse to continue sealing them from the vacuum outside. As he left the bridge, he charged Decimus with finding a new chief engineer for the vessel—one who could be trusted. "The Covenant already treats its warriors as tools. It's why we left. The warriors who will follow me will do so because they know me. Because they have seen me--and they know I will fight whoever it takes, wherever I have to--and that I will win, no matter what." Atriox in battle with Sig Raan's Yanme'e. At some point soon after the incident aboard the battlecruiser, Decimus suggested that the Banished travel to the planet Otraak. It was largely-unknown that the Covenant had a presence there, but Decimus was acquainted with a Kig-Yar scientist operating out of an installation on its surface by the name of Sig Raan. If Raan could be persuaded to their cause, then they would gain a significant source of ingenuity and technological capability. Decimus led four other Jiralhanae on an expedition to this installation and met no resistance but for some unarmed Unggoy which were called off by Raan soon after ambushing them. The T'vaoan invited the Brutes inside to show off what she had invented: a device that mimicked the sonic and pheromonal signals of a Yanme'e Queen, allowing its user to control many of Yanme'e drones. Rather than pledging herself to the Banished, however, Raan turned on Decimus and ordered her drones to attack. Just as it looked as if the swarming Yanme'e would be too much for the Jiralhanae, Atriox revealed himself atop a high platform within the chamber they all found themselves. He let the Kig-Yar know that he had known all along of her treachery and only sent Decimus ahead of himself so that she would show him what she had created. Leaping from his perch, he battered Yanme'e with his gravity mace, Chainbreaker, and landed on his feet. His ferocity against the drones inspired his compatriots to fight back alongside him with renewed vigor. Sig Raan was aghast at the ineffectiveness of her drones against Atriox, even surmising that there may even be a problem with her invention. Born aloft by a Yanme'e, she evaded Atriox before he could deal with her personally, but her escape was cut short by a blast of superheated plasma fired from Decimus' Type-25 plasma pistol. The shot killed the Yanme'e carrying her and she plunged to her death from high above the floor. Some time later following Rann's death, Atriox and the others had still not left the installation. Decimus was enthralled with the possibilities that the scientist's invention could offer them, but upon hearing of his plans to make Yanme's thralls serve as engineers and fighters, Atriox snatched the device away and crumpled it in his hand. Decimus was horrified, but Atriox adamantly explained that while the Covenant had treated its warriors as tools, he aspired to a much higher standard for himself. The Covenant's disregard for its troops, after all, had been the reason they had left it. Atriox enthusiastically stated that he wished for those following him to do so because they know him and know he will do whatever it takes to accomplish his goals, not because they are tricked into doing so by a peculiar technological and biological cheat. The destroyed device was left behind when they took their leave. "I see you for what you are and what you could be. We can do great things together. Not as master and slaves, but as the warriors you truly are -- free to continue your crusade without the shackles of outdated faith." — Atriox to Resa 'Azavayl and the rest of his Silent Shadow squad. Let 'Volir swears fealty to Atriox. With the demise of the Covenant Empire in 2552, Atriox acquired numerous weapons and soldiers once belonging to its vast military. Atriox's experience fighting against the Covenant gave the Banished a strong advantage over other factions in the post-Covenant War galactic environment. The collapse of the former hegemony also afforded him and his Banished an enormous opportunity to fill new power vacuums and to consolidate weaponry, vehicles, and ships left behind or weakly held. At last, the faction could stop having to run from the Covenant after attacking it with guerrilla tactics. At some point following the Great Schism, a Sangheili squad of the Special Operations division, the Silent Shadow, began to mercilessly hunt down and slaughter groups of Jiralhanae and any others found associating with them. Atriox was leading from the only vessel that remained to his forces at that point, a captured SDV-class heavy corvette, Elegy's Lament. The Silent Shadow, led by Resa 'Azavayl, managed to infiltrate the vessel and catch several Jiralhanae off-guard thanks to the use of active camouflage. An alarm was soon sounded, tipping Atriox off to the assassins' presence on his ship. When the Sangheili finally approached Atriox on the bridge, he was ready. He invited the would-be assassins to show themselves and proceeded to question their motives. Resa had been unaware that his target was Atriox, whom he called "the betrayer". Atriox conceded that he would gladly fight the Silent Shadow if necessary, but he made it clear that it would be in the interests of all involved to join forces. He had mentioned to them that he was not involved in the betrayal and massacre of the Sangheili, and the squad began to view him as "other". Atriox mocked Resa's short-sightedness and stubborn adherence to old hatreds. Resa was not swayed from his task upon hearing Atriox's words, but the others responded quite differently, driving their energy swords into their leader's back and allowing themselves to be welcomed into the Banished. Following this, even more Sangheili joined the Banished's cause. Atriox walks away while a human city burns. The most powerful asset he gained was the CAS-class assault carrier Enduring Conviction, along with her experienced Sangheili crew and warriors. By May 6, 2553, ONI learned of a recent engagement during which the carrier had broken from its fleet decidedly. Atriox had sent forces to raid an air base on a planet belonging to the Covenant separatists but when the carrier's shipmaster, Let 'Volir, found him within its armory, Atriox dropped Chainbreaker and voluntarily gave himself up for capture. A Type-52 Phantom took he and a number of his forces to the Conviction. The shipmaster was hailed and asked to confirm that he had captured Atriox, but the Brute instructed him to give no answer. 'Volir was surprised by his boldness and only grew more confused when he was told that Atriox had tried to spare as many of his crew on the ground as he could, because they would need them. Only once 'Volir had been given a small measure of the warmaster's intentions was he then told to give the confirmation to the asker. In his proposal, Atriox appealed to Let's wavering faith in the Great Journey and his devotion to his ship and crew, offering to provision and fuel both, respectively. Twelve hours later, Enduring Conviction broke formation and severed contact with the rest of the fleet. The Conviction was hailed, warned, and then fired upon when her crew ignored orders. The Conviction performed evasive maneuvers, returned fire and escaped by performing a pinpoint slipslape jump with a maximally ionized hull. The resulting shockwave devastated many small craft caught in the wake of the Conviction's first jump point. The ONI operatives later examining the matter concluded that the manner in which the Conviction escaped her fellow Covenant separatist ships matched a previous encounter the UNSC had with the ship during the war and that this was indicative that Atriox had not taken it over by force. Instead, it seemed to them that his capture was either a ruse from the start on behalf of both parties or, as had happened, that Atriox simply allowed himself to be taken so that he could make a proposal to 'Volir. Soon after escaping, they made their way to Ansket IV, where a Covenant hydro-processing center had come under control of the UNSC. The humans on the world were attacked so the facility could be use to fuel the Banished's new ship and at some point soon afterward, 'Volir and his crew reluctantly swore fealty to the Banished on neutral territory--an orbital installation. In exchange for their unquestioning loyalty, the Banished would supply the crew and fuel the Enduring Conviction indefinitely. The ONI operatives analyzing the ship's shift of allegiance surmised that Atriox would lay low for a while after securing such a prize, as he would have painted a metaphorical target on himself in doing so. By the end of 2553, ONI operatives were aware that Lekgolo had begun to be incorporated into the Banished in addition to multitudes of ex-Covenant who simply didn't wish to stop fighting. On at least one occasion following the acquisition of the large boost to his forces that 'Volir brought, the Banished sacked an entire human city. By December 2553 Atriox and his Banished had already carved out a fearsome reputation among ONI and the Keepers of the One Freedom alike. Nereus X in the Nereus system was used in December as a temporary hideout for a Banished flotilla and the planet Shamsa had been made a supply hub for the faction. By January 2557, some human salvagers knew of Atriox, but only to the extent that he led a group competing for plunder and salvage. By March, however, his trail had run cold as far as the ONI agents keeping track of him were concerned. The last time they had heard of him he had captured a number of Huragok. Following the firing of one of the two agents in question, frequent surveillance of his acts ceased as far as they were concerned. Unknown to them, their conversations about Atriox had been spied on without their knowledge for years by Section Zero, meaning they were not the only ones with knowledge of the Jiralhanae warmaster. "Get everyone you can on that ring. Take it from the humans. Prove you are still worth your price." — Atriox to Let 'Volir. Atriox inside the Henry Lamb Research Outpost. Following the subjugation of Earth by the Created in October 2558, the portal linking Installation 00 to Earth shut down without any warning for those stationed on the installation. A month later, on November 25, Atriox and the Banished arrived in force aboard the Enduring Conviction. Atriox charged Decimus with leading the massacre of the humans on its surface. In little time, the humans had all been killed and the Ark belonged to the Banished. Atriox had led them there in order to construct a Halo ring, but the ability to do so apparently eluded him. Over the next four months the Banished established mining and resource extracting operations on the Ark and mastered its portal network for quick translocation across it. On March 28, 2559, the UNSC Spirit of Fire, a retrofitted Phoenix-class colony ship that had been missing for 28 years, arrived at the Ark after being pulled through a portal by an unknown entity. The Banished's presence went unknown to the ship, which dispatched a reconnaissance team and a trio of Spartans to investigate a distress signal coming from the Henry Lamb Research Outpost. Anticipating the arrival of the Spartans at the outpost, Atriox and a number of other Jiralhanae hid inside it and waited. After the three humans retrieved the artificial intelligence and source of the distress beacon, Isabel, Atriox sprung the trap. He managed to surprise them by lunging from the shadows to grab Alice-130 and lift her into the air. The others immediately reacted by engaging Atriox with short bursts of gunfire, but the massive Jiralhanae responded in turn by battering them with his powered gauntlet and gravity mace. All three were easily kept at bay by Atriox, who outmatched them in strength and durability. Douglas-042 and Jerome-092 both managed to get in close and stab and slash him with combat knives, respectively, but Atriox did not even react to the wounds. 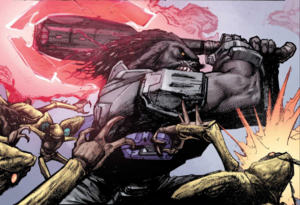 After tossing Alice and Jerome away he used brute force to clamp down on Douglas' Mjolnir armor with his powered gauntlet, rendering him incapacitated. From there, he slammed him with Chainbreaker, the gravity mace, sending him flying and knocking his helmet off. As Alice and Jerome cautiously recovered Douglas, now unable to even stand and teetering on the edge of consciousness, Atriox mocked the Spartans and the legends that had sprung up around them among the Covenant. Alice and Jerome dragged Douglas away while Atriox just laughed. After they had gone, he ordered the Jiralhanae in the outpost with him to hunt them down and to find out where they had come from. Let 'Volir and Atriox survey the Conviction's wreckage. The Spartans managed to escape their pursuers, and before long a small force moved against the salvage operation being overseen by Decimus, who made a personal appearance to defend his work. The humans were too much for him, however, and he retreated through a portal. Upon learning of this, Atriox ordered his right hand to report to him immediately and commanded that all Banished outposts be put on alert for UNSC assaults. Data recovered during the skirmish led Captain James Cutter and the other humans to discover Atriox had taken possession of a Cartographer to locate key systems and weapons across the Ark. After they made an aggressive push and wrested control of it from the Banished, Atriox reassigned Decimus to protect likely targets that were crucial to upholding their portal network. Though his troops had been spread far and wide thanks to the portals, mass redeployments were undertaken quickly to defend key sites once the Cartographer was lost. Decimus ultimately died defending the areas he had been ordered to, and at this, Atriox finally called for Enduring Conviction to begin attacking the Spirit of Fire. The humans responded by using a Forerunner particle cannon on the Ark to immobilize the carrier and drain its shields. Atriox retaliated by sending everything he had in the area at the site of this cannon, and he personally transmitted a message wherein he taunted and threatened Douglas-042. These efforts were to no avail, however, as Jerome-092 and Isabel managed to infiltrate the Enduring Conviction and use its ventral beam to provoke an attack on it from the installation's Aggressor Sentinels. Atriox could only watch as his flagship was cut into two pieces, which fell to the Ark. Atriox was enraged at the loss, and doubly so due to the fact that Professor Ellen Anders had successfully managed to launch a Halo ring. As it rose from the Foundry, he told Let 'Volir to get everyone he could on the ring immediately and to take it from the humans, noting that If he could do so, it may prove him to still be worth his price. Atriox stands before his army. Troops began to be ferried to the ring via access points designed for sentinels. The Banished quickly gained a foothold near the UNSC's Alpha Base and Atriox for the first time made contact with Captain Cutter directly. He admitted that he was impressed with the humans' tenacity and even conceded respect for the captain. Not realizing the Spirit of Fire lacked slipspace capabilities, he promised he would not hunt it down if Cutter simply left the Ark. Cutter responded with defiance, so Atriox made it known that he had destined he and his crew for destruction. He sent everything at his disposal to stop Anders from engineering a communications beacon at the Halo's control room and again reached out to Cutter in an attempt at intimidation. Through the control room, the professor ejected a section of the ring's surface into space along with all of the Banished fighters that had been on it. The Halo was lost to Atriox right before it completed its transition into the portal that would carry it toward the Soell system. It had only taken five days for the Phoenix-class colony ship and her complement to destroy nearly everything Atriox had built on the Ark and to end his goal of controlling a Halo. Devastated by the disappearance of his prize, Atriox slammed his fist downwards on a holotable, shattering and denting a corner of it. He then walked out to a cliff edge to observe the numerous forces still left to him. The fight between the Banished and the Spirit of Fire continued for months, at one point leading to a battle amidst the wreckage of the Enduring Conviction. Atriox berates Voridus for disobeying orders. Voridus: "We did it! We've beaten it back, brother. Atriox will be pleased!" Pavium: "I don't think pleased is the right word, brother. Atriox will arrive soon. He may not be as merciful as the Flood." — Brute brothers defeating the Proto-Gravemind. After two months of conflict with the Spirit of Fire, Atriox was apparently no closer to defeating the humans on the Ark. In order to try and turn the tide he sent Pavium and Voridus to High Charity's wreckage to salvage anything they could get, but warned them not to go inside. This proved to be a fateful decision, as Voridus chose to ignore Atriox's warning and entered the remains of High Charity. This resulted in the Banished coming into contact with the Flood, which had built itself up from spores that had survived the detonation of High Charity's backup reactor and the firing of Installation 08 in 2552 at the end of the Human-Covenant War. Because of the ensuing conflict with the Flood, Atriox had to abandon his plans to fortify positions around the Ark to battle the humans and focusing on containing the Flood, due to it posing a greater threat. Atriox himself apparently stayed clear of any confrontation with the Flood but kept in regular contact with Pavium and Vordius, all the while making it very clear that he was most displeased with the situation. Following the death of the Proto-Gravemind, Atriox arrived on the scene with a retinue of Jiralhanae bodyguards. Although the Flood had been dealt a devastating blow, with the elimination of its collective consciousness the threat was still very much active, and by this point, over forty percent of the Banished troops under Pavium and Vordius' command had perished in the confrontation. As he strolled across the gore-splattered field Atriox verbally reprimanded Voridus, reminding the younger Brute that he ordered them not to go inside High Charity. At that moment, a Flood infection form leapt at Atriox, who caught it in mid-air and crushed it beneath his gauntlet. Hurling the body at the Jiralhanae lieutenant, he yelled "For good reason!" Turning to Pavium, he ordered the Warlord to take his troops and secure the breach in the High Charity defenses to prevent any more Flood from escaping, thus further jeopardizing his plans. Standing menacingly over Voridus, Atriox told the lieutenant to fix his mistake and then declared that he would personally deal with Voridus once they were done. As the two Jiralhanae brothers left to carry out their orders, Atriox surveyed the scene one last time. He stayed just long enough to notice swarms of Sentinels zooming across the Ark's skies, in order to neutralize the Flood before departing the scene. "Vengeance is petty. Vengeance has no reward." — Atriox responding to Resa 'Azavayl's animosity towards his species. Atriox berates Let 'Volir following the destruction of the Enduring Conviction. Vicious, cunning and brilliant, Atriox is a deadly warrior and the skilled warmaster leading the Banished. Atriox rose to power through fierce tenacity and shrewd strategic planning. He is highly ambitious, seemingly holding power for its own sake as his supreme value and motivation. Atriox is a versatile soldier, collecting and repurposing former Covenant military weapons, vehicles, and other equipment to allow the Banished to gain strength against other factions. In addition, he eschews the Covenant's reverence for Forerunner artifacts and has no compunction over taking control of them for his own ends. He holds an extremely pragmatic view of warfare and understands the importance of supporting infrastructures and how to build armies and structures cheaply and efficiently. 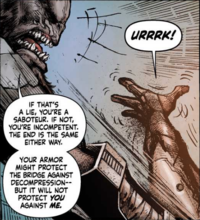 Atriox's brilliant strategies are unconventional when necessary and imitative when efficient—for he will adopt whatever techniques and technologies he has to in order to guarantee victory. His use of Huragok and compact assembly vats in forward bases would have been considered unorthodox - even heretical - under the Covenant's traditional war creed, but those days are past. After encountering the Spartans of Red Team, it amused him when he confirmed that they were indeed only humans beneath their armor. He subsequently mocked them by calling them "little demons". Harboring a hatred of the Covenant and its remnants, Atriox seems to follow a philosophy of utter, amoral pragmatism, focusing solely on gathering power for himself and the Banished as a whole and ignoring whatever he cannot leverage as a useful asset. He is apathetic to the brutality and suffering that prevail in the Banished's ranks as long as he gains results, and has no attachment to faith, actively lauding it as outdated and needless. Likewise, Atriox has no animosity towards humans, nor does he care for the Sangheili-Jiralhanae feud. Atriox views both humans and Sangheili as warriors with potential usefulness to him; though other leaders would struggle to hold control over bitter rivals on the battlefield, Atriox's charisma and the fervor it inspires in his followers makes it possible. Of note, Atriox is also fluent in basic Sangheili. His open minded philosophy was also demonstrated by his interactions with the UNSC crew of the Spirit of Fire. During the fight at the Henry Lamb Research Outpost, Atriox intentionally let Red Team escape with his forces in pursuit, both as a show of power and to discover where the Spartans came from. Later, on Installation 09, he offered Captain Cutter and the Spirit of Fire another chance to walk away peacefully, and was impressed by Cutter's refusal to do so. Atriox wears unique black and white combat armor, which is partially of United Nations Space Command origin. It is made from various pieces, including an ODST chestplate. He also dons an augmented power gauntlet which artificially enhances his strength to a significant degree. In battle, he wields a customized energy mace called Chainbreaker, which he created from parts of a Type-2 gravity hammer. Check out our collection of quotes related to Atriox in its quotes page. Atriox serves as the primary antagonist of Halo Wars 2, with Dan Ayoub of 343 Industries desiring to tell a deep story with the character in the game's cinematics. 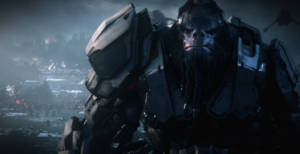 First being introduced in the announcement teaser for Halo Wars 2 as an unidentified Jiralhanae leader, Atriox's name and nature were expanded upon at the 2016 Electronic Entertainment Expo, where it was also revealed that Atriox would serve as one of the game's six playable leader characters at launch. Following the pseudo-Latin theme of most Jiralhanae names, Atriox likely comes from the Latin atrox ("furious", "savage"), the root of the English atrocious and atrocity. Notably, Atriox features neither the -us nor the -um suffixes present in the names of most mature Jiralhanae. A life-size Atriox animatronic puppet was created for the comedic War of Wits live-action trailers The Sale and The Armrest. As part of the campaign, Atriox was given a fake bio on the website of the real-life car dealership Camacho Auto Sales. According to his profile, Though new to sales, Atriox has over a decade of management experience as leader of The Banished. Like his favorite weapon, an energy mace known as "Chainbreaker," Atriox is fond to claim his deals are "off the chain." The bio, as well as the live-action shorts, identify the character as "General Atriox", although this has been confirmed not to be his canonical title. Atriox is voiced by actor John DiMaggio. DiMaggio previously voiced the generic Brute chieftains in Halo 3 and Halo 3: ODST. Atriox was originally going to appear in Halo: Silent Storm, but 343 Industries requested for Troy Denning to fill Atriox's role in the novel by Orsun in the second or third review. A concept sheet of Atriox for Halo Wars 2. A render of Atriox with no beard, before he left the Covenant. Size comparison between Atriox and a human. A highlighted view of the Blur Studio Jiralhanae statue. Detailed version of the Blur Studio Jiralhanae statue. Atriox with Chainbreaker in the Know Your Enemy trailer. Atriox pretends to talk to his manager in The Sale. A promotional image of Atriox for Halo Wars 2. Model of Atriox for Halo Wars 2. Atriox as a member of the Covenant. Atriox drops his gravity hammer in defiance of the Covenant. Atriox catches the energy sword. Atriox towers over his attacker. Atriox uses Chainbreaker to lift Red Team off the ground. Atriox uses his power gauntlet to crush Douglas-042. Atriox standing before Installation 09. Atriox takes his anger out on a holotable. Atriox and a holographic display of High Charity's wreckage. Atriox crushes an infection form. Atriox orders Voridus and Pavium to contain the Flood. Atriox stands before the dead Proto-Gravemind before moving on. The Atriox figure from the fourth Halo Legendary Crate. Poster of Atriox from the Loot Crate. Atriox on the cover of Halo: Rise of Atriox#1. Atriox during a suicide mission. 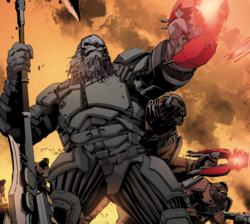 Atriox on the cover of Halo: Rise of Atriox#2. Atriox during the Algolis Invasion. Atriox takes a direct hit from his attacker's gravity hammer. Atriox stops the Executioner's blood blade. Atriox kills the Executioner with his own blood blade. Atriox stands with the Executioner's blade and helmet. 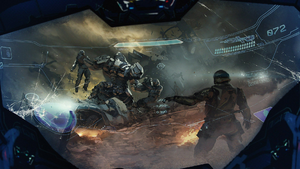 Decimus and Atriox fighting Yanme'e on the cover of Halo: Rise of Atriox#3. Atriox after crushing the remote. Atriox talking to Let 'Volir on the cover of Halo: Rise of Atriox#4. Atriox after killing Sangheili Minors with Chainbreaker. Atriox on the cover of Halo: Rise of Atriox#5. Atriox kills Jovus with Chainbreaker. ↑ Twitter: "Here's to our birthday boy, Atriox!!" ↑ Halo Wars 2, Phoenix Logs – "The Graveyard"
↑ 33.0 33.1 Halo: Tales from Slipspace, Hunting Party - "So, you've simply traded one leash for another. Vengeance is petty. Vengeance has no reward." ↑ Halo: Official Spartan Field Manual, page 161 - "In theory, all who can aid Atriox's ambition and will bend the knee are welcome, from human to hunter, but their violence and conditions of service limit recruitment opportunities." ↑ Halo: Tales from Slipspace, Hunting Party - "I see you for what you are and what you could be. We can do great things together. Not as master and slaves, but as the warriors you truly are."